The San Francisco Recreation and Parks Commission (SFRPC) is planning to approve the Significant Natural Resource Areas Management Plan (here called the Project) on December 15, 2016. This will happen if the Planning Commission certifies the Environment Impact Report, which we hope they won’t do. That document is seriously flawed, far from objective and containing numerous inaccuracies. But if it does get certified, then at the same meeting, SFRPC will vote on the Project. If they must approve a plan, we ask them to approve instead the Maintenance Alternative that allows the Natural Resources Department (formerly the Natural Areas Program) to keep doing what they’re doing now but not make it worse. Apply toxic pesticides: The Natural Resources Department uses more Tier I (most hazardous) herbicides than any comparable park area, including Roundup, a probable carcinogen. For more information about NAP’s pesticide use, CLICK HERE. For information about the chemicals they use, CLICK HERE. -1- IT’S BASED ON XENOPHOBIA. The Project is inherently xenophobic, trying to destroy successful and adapted plants and trees that are “non-native” or “not from here.” This is a dangerous point of view, especially now, when we should welcome all those who make our wonderful city a better place, whether its trees that clean our air and trap the carbon we and our vehicles emit, or people who add to its wonderful diversity. We should not, as a city, buy into any plan that’s based on Nativism. -2- DESTROYING MAGICAL FORESTS. San Francisco is hugely fortunate to have dense forests over a century old. Elsewhere, these magical woodlands would be treated as a special thing, something to tell tourists about. 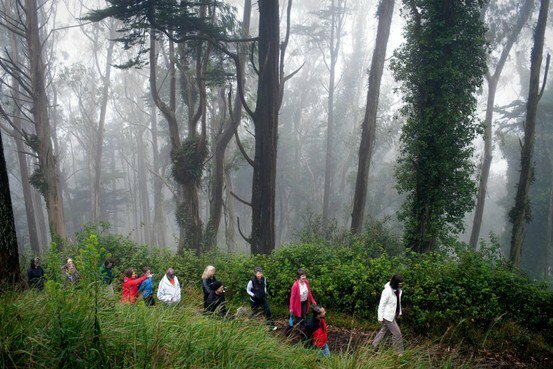 These forests are some of the most beautiful places in San Francisco, especially on foggy days when the tops of these 200-foot tall trees disappear into the mist and the internal rain patters on the undergrowth. How can we to cut them down? It’s like vandalism. -3- EUCALYPTUS, A PARTICULARLY SAN FRANCISCO TREE. Not only is it a historic part of our landscape, and contributing significantly to its beauty, people love them. Other trees can’t stand our windy hills, but eucalyptus grows there and makes a wind-break. They’re adapted to our climate, self-watering by catching moisture from the fog. They also provide moisture that keeps the forest green through the year, even during drought. They live for hundreds of years, they’re amazing at storing carbon because of their height, the density of their wood, and their longevity. They came, like so many of us or our ancestors, from someplace else and have adapted to improve our city. -4- OUR EUCALYPTUS TREES IMPROVE LIFE IN THE CITY. The San Francisco of 200 years ago was a difficult place for humans – bare, extremely windy, very sandy. Blown sand got everywhere, including into people’s lungs. The trees provide a windbreak, reducing wind speeds. Without them, these would be windblown sandy hillsides. The intergrafted roots stabilize our hillsides, and help regulate water flowing through so our sewer systems don’t get overwhelmed. If they weren’t there, we’d have a lot more flooding of low-lying areas. Even Islais Creek flows through Glen Canyon – and ends up in our sewer system. Forests hold water like a sponge, and release it gradually over days or weeks. -5- EUCALYPTUS IS HABITAT. 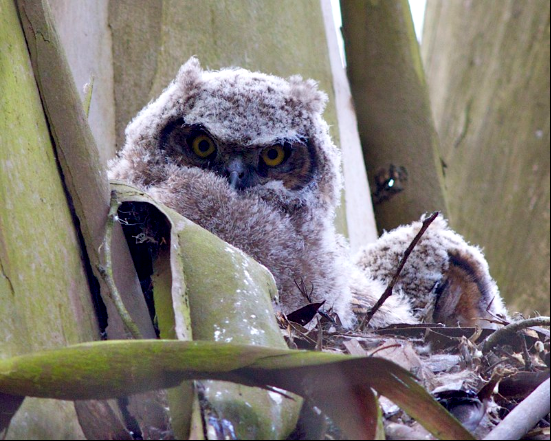 It’s important habitat for our wonderful birds, providing nesting sites for birds like great horned owls, flickers – a kind of woodpecker, and hawks. It’s the world’s largest flowering plant, and provides nectar in winter to honeybees and other insects, wintering roosts for Monarch butterflies, and foraging sites for birds like kinglets and brown creepers. Cutting down eucalyptus trees is ecologically destructive. -6- HAZARDOUS HERBICIDES. The Natural Resources Department, in the first ten months of 2016, used more herbicides than any comparable area of SF Recreation and Parks Department (SFRPD). In 2016 through October, other SFRPD departments (excluding Harding Golf Course, which is managed under contract by the PGA Tour) applied herbicides 19 times. The Natural Resources Department used them over 100 times! They use only Tier I and Tier II herbicides (most hazardous and more hazardous) including Roundup, which is a likely carcinogen. Since April 2016, SFRPD (without Harding Park) has all but eliminated its herbicide use – except for the “Natural” areas! Endorsing this Plan will only make it much worse as thousands of trees are cut down and herbicides used to prevent resprouting. -7- “STAY ON DESIGNATED TRAILS” MAKES NATURE BORING FOR KIDS. Children enjoy nature by interacting with it. They want to run through tall grass, pick flowers, carry sticks as staves, eat sourgrass and blackberries straight from the plant. They want to watch birds and animals in the trees. 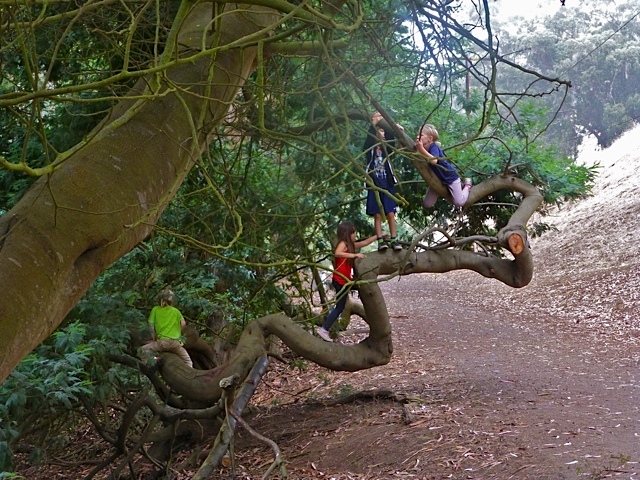 They want to climb trees and swing from rope swings tied in trees, not just the metal chain ones in playgrounds. Natural areas should allow for exploration, for impromptu picnics off the trail, for hide-and-seek among the trees. This is how you foster a love of nature. The Natural Areas prohibit all these things. The only thing that’s allowed is walking along a narrow path and looking at the park. And all that does is to convince kids that Nature is boring, and they’re better off with video-games where they can actually do something. -8- DOGS NEED PARKS SPACE TOO. A very large number of San Franciscans have dogs. They’re part of our family, dear to our hearts. They need space for recreation, too, and taking our dogs to these parks encourages their people to appreciate nature too. Most of our dog-play areas are in the Natural Areas. And yet the spaces available to them has been shrinking. -9- DOGWALKERS HELP MAKE PARKS SAFER FOR EVERYONE. Even if you don’t have a dog, it’s dog-walkers who are the eyes and ears of our parks. They’re the most consistent users, and they’re there in all weathers, all day. Paws in our parks means eyes in our parks. -10- BICYCLES IN OUR PARKS. Riding bicycles is an important value for us and our children, and a wonderful low-impact way to recreate. But the Natural Areas block most of our parks to bicycles, thus discouraging this excellent way to appreciate the outdoors. I think the NAP should be sued, Court actions often bring attention and change minds. The NAP has been a pox on our city for many years. The program should be eliminated entirely. They are plant racists, convinced of their righteousness, determined, and destructive. They consume funds from our City budget, they are clever at disguising their destructive intentions and skillful at political propaganda. A smart and responsible politician would remove them and strip them of any authority.